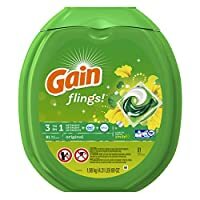 Everything you love about Gain is even better - and smaller - with the new Gain flings. Everything you love about Gain is even better-and smaller-with the most Gain scent. Gain Original scent will freshen every fiber, so your nose and clothes will thank you. Enjoy the matching Gain Original scent in liquid fabric softener, Fireworks, and dryer sheets. Laundry detergent that smells so great and is so simple to use, it makes doing laundry almost exciting.